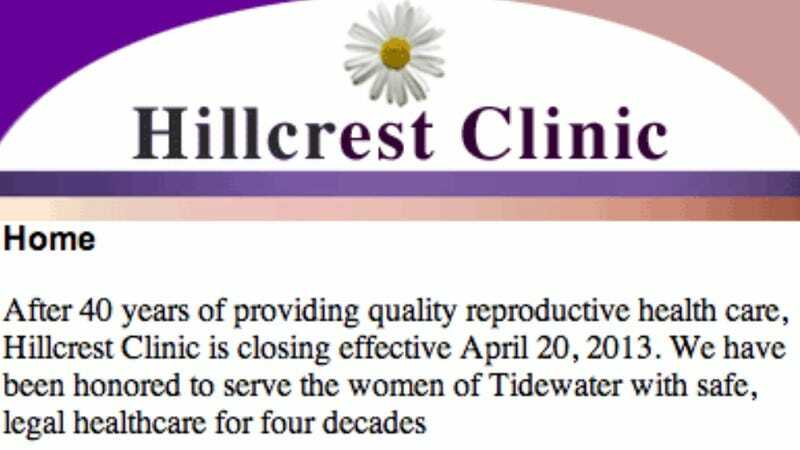 Norfolk's Hillcrest Clinic, one of Virginia's 20 (well, now 19) remaining abortion clinics, shut its doors last weekend after forty years of service thanks to new regulations mandating new and completely unnecessary building and hygiene specifications. Hillcrest would've had to raise $500,000 in renovations — including changing ventilation and temperature controls, renovating the widths of their doors and halls, and increasing the number of parking spots — to stay in business. Last Friday, the Virginia Board of Health decided by an 11-2 vote to approve regulations on abortion providers, similiar to other "TRAP" (Targeted Regulation of Abortion Providers) laws pushed by legislators in states like Alabama, Mississippi and North Dakota. Politicians love to pretend that these laws are crucial for "women's health" when the real goal is to shut down every abortion provider around; Virginia's horrible Attorney General/governor wannabe Ken Cuccinelli once straight-up said the restrictions are designed to “make abortion disappear in America.” He's certainly trying. The majority of Virginians oppose these regulations, and originally, the state Board of Health voted to allow existing abortion providers to be "grandfathered" into the program so they didn't have to spend precious time and money widening hallways for no reason other than to fufill rabid anti-choicers hopes and dreams. But Cuccinelli told board members that they could be held personally liable for any legal fees if clinics were sued, and that was the end of that. To add insult to injury, the pointless regulations only apply to abortion clinics, not to other health clinics that provide way more potentially dangerous outpatient medical services like vasectomies or colonoscopies. Because women seeking abortion need the most help/widest hallways, we suppose. Next up: a bill that fills those hallways to the brim with oversized plush fetus dolls and crisis pregnancy center fliers so it's even harder for women to make their own reproductive choices.